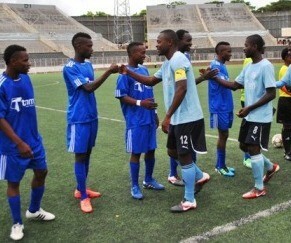 Silver Strikers and Mighty Wanderers will today renew their rivalry when the two teams clash in a mouthwatering Malawi elite league match at the Silver Stadium in Lilongwe. The Nomads will be without their first choice goalkeeper, Richard Chipuwa, and their coach will have to choose between Bester Phiri or Peter Munthali as Chipuwa’s replacement. The Lali Lubani side will also be without two of their key players in defender Stanley Sanudi and midfielder Isaac ‘chair’ Kaliati who are with the Malawi national team at the Cecafa senior challenge cup in Ethiopia. Silver Strikers will be without their midfielder Blessings Tembo who has been ruled out for six weeks after he sustained a fracture on his left leg. The two clash today in Lilongwe. Tembo got injured during last Wednesday’s goalless Super League game against Airborne Rangers at Chitowe Stadium in Dwangwa, Nkhotakota. The central bankers will miss the services of Tembo when they will be battling it out with the Nomads this afternoon as he has been instrumental in most of their games, and has been scoring vital goals and making assists for them. Silver Strikers will be going into this game from the draw against Airborne Rangers whereas their opponents’ last game was a two all draw with Blue Eagles. The bankers are third on the log table with 39 points from 25 games while the Nomads are ranked 7th on the table with 32 points out of 22 games. The last time the two sides met was on Sunday 21 June at Kamuzu stadium and the game ended 2- 0 in favour of the Lilongwe based giants. It is promising to be an entertaining match as both sides have promised to win the game this afternoon. Wanderers head coach Elia Kananji said his team is ready for the Silver encounter and they will try all their best to win the match and rejuvenate the Nomads’ form as they have only registered only one win in the past nine games.